The forces used to bring sturzstrom to life are modest, essentially drawing on just two timbres, voice and percussion; the vocal parts comprise a choir and orator, while the percussion focuses on pebbles, with two distinct rhythmic strands plus a ‘pebble choir’, charged with creating an assortment of textures. In truth, though, despite the fact that it’s built upon a huge quantity of text, the entire work is textural. Unfolding in highly contrasting sections, sturzstrom is a veritable litany of vocal effects; glissandi, whispers, bellows, humming, speech and singing accompany, intermingle with and collide against the bangs and scrapes of the pebbles, all notated in a semi-aleatoric way that lends a (semi-) unpredictable aspect to sturzstrom‘s inner voice, and thereby makes its textures more naturalistic. Almost never is the underlying text allowed to be heard clearly, and this too heightens the overall effect; words occasionally can be half-heard somewhere, briefly evocative but instantly lost in the melée. Only when the orator’s speaks—the rest of the performers falling more-or-less silent—is the text clearly heard, and i must admit to being ambivalent about these sections; while the conclusion is rather poignant, the earlier passages felt over-long and a disruption both to the work’s momentum as well as to its effective nebulous timbres. The première took place in the long, narrow opening section of the caves, carved by the Saxons, and it was surprising to hear such an otherwise resonant acoustic deadened by the large body of people crammed into it. i’m not sure whether this helped or hindered the piece; even from my vantage point—at the front, only a few metres from the performers—the fortissimo passages didn’t prove to be quite as overwhelming as one thought (and worried!) that they might. However, the fact that the chaos and cacophony didn’t overwhelm made it possible to remain aware of their complexities, so perhaps it was all to the good. 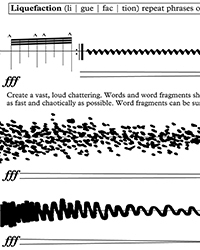 Marc Yeats specifically composed sturzstrom with non-trained performers in mind, “designed to utilise the voice rather than singing ability and […] conceived and notated in such a way as to enable maximum participation from individuals with little or no experience of singing or reading conventional musical notation”. 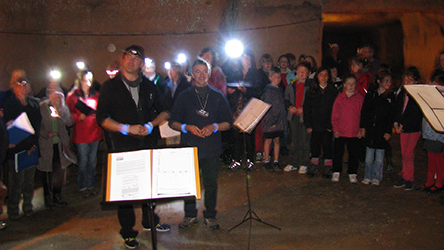 This too worked to the advantage of the piece, the amateur choir bringing genuinely rough edges to the work’s necessarily coarse episodes; and the pebble choir, performed by children from Seaton Primary School, could hardly have been more vigorously ear-splitting. To some extent, its community project limitations prevent it from aspiring to the kind of terrifying tectonics of Xenakis, but as an exercise in raw energy that enables young and old alike, regardless of musical background, to engage fully with contemporary music, sturzstrom is an admirable and exhilarating enterprise. It will be performed again (in rather less lugubrious surroundings) on 8th July at Poole Lighthouse and 27th July on Weymouth Beach, together with the other three commissioned pieces; details here. More information about sturztrom can be found in Marc’s blog about the work, here. My recording of the première—which in some ways is as rough as the piece itself(! )—can be downloaded below.